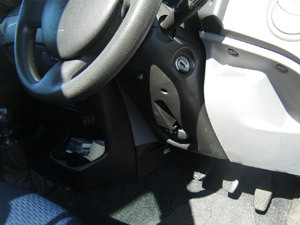 On the Punto dashboard, the steering wheel light comes on and the power steering fails. This might happen intermittently, or it might have been happening every now and then and now the power steering has failed permanently. One thing to try: Press the 'City' button and switch the engine off, then back on again. This got the power steering working for us for a while, although it did fail completely after a while. One or both of the electronic relays on the power steering motor have failed. You could take them off and replace them, but that involves a lot of soldering and personally I decided it was easier to get a replacement power steering motor from eBay and fit that instead. 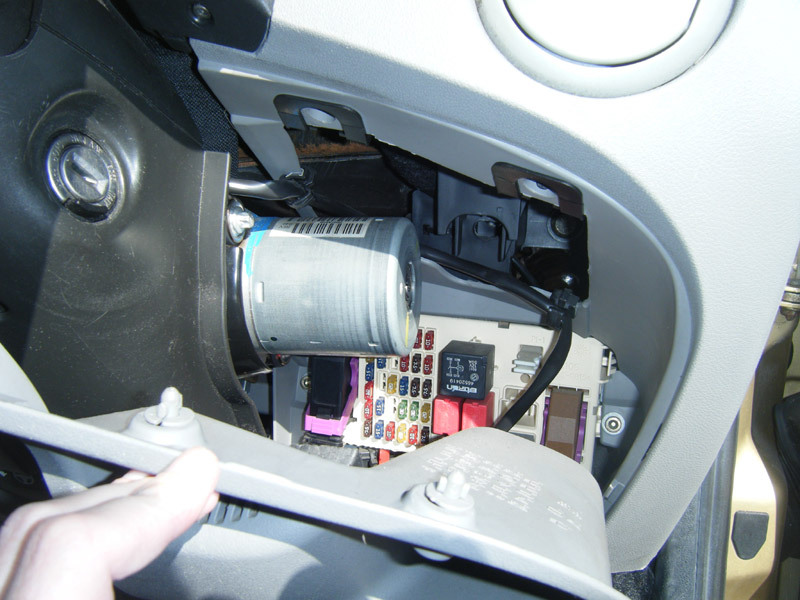 If you want to take the relays off, you will need to follow the power steering removal steps below, then you can fiddle with the motor as much as you like. 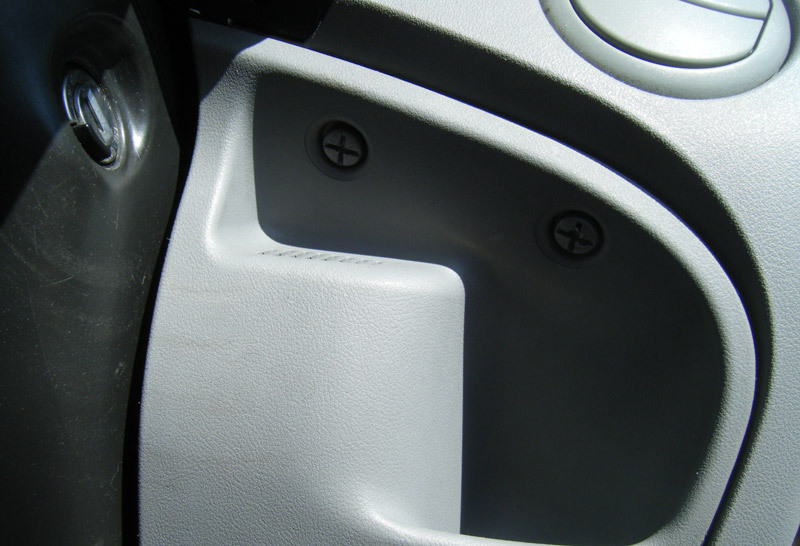 Push the drivers seat right back to give yourself some room. Looking at the steering column, next to it (on the right on my right hand drive, UK Punto) is the panel that covers the fusebox. 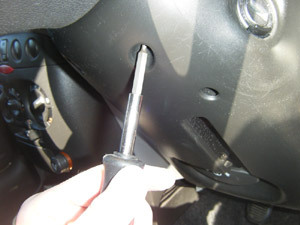 Unscrew the two large screws at the top using a large bladed flat head screwdriver. The panel hinges down, then you can push it in a little to unhook the hinges and put the panel out of the way. You can now unscrew the four screws holding the plastic cover over the steering column. These screws have Allen key (AKA Hex key) heads , and the bottom ones are quite deep so you'll need a very long Allen key or a screwdriver mounted one. The size fitting on my borrowed ones were "CR-V3", the closest fit I had on another set were 3/32" but that one wasn't a great fit, the V3 ones fit great. Basically, buy or borrow a set of them. 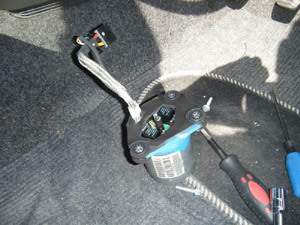 The top two screws are easy to find, the bottom two are either side of where the handle to move the steering column fits. They are a bit of an awkward angle and I had to wedge my head under there a couple of times to make sure the Allen key went in to the screw head properly. Expect to swear. When all four screws are off, you can pull the plastic steering column cover down and off. Be a bit careful as there are plastic tabs holding it to the upper half, and you have to jiggle it around the lever that lets you adjust the steering column height. Now the cover is out of the way, you can hopefully see a bunch of wires, mainly behind a metal plate. 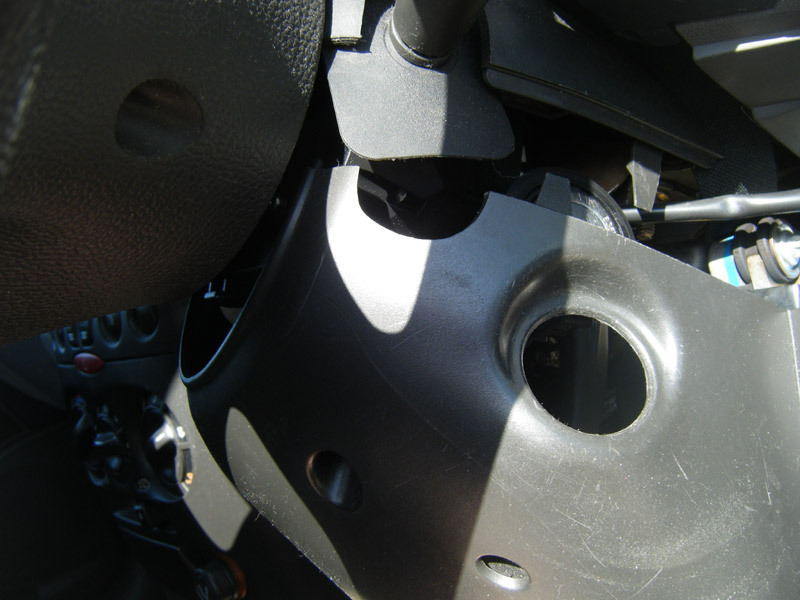 You need to unbolt the plate, which has 10mm bolts holding it on. When you've unscrewed the three bolts, one of the bundles of wires will still be attached to the other side of the plate with a plastic hook, so don't pull the plate off. 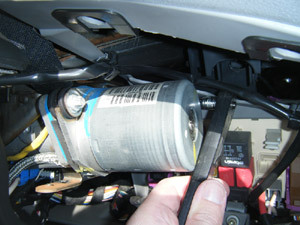 In the picture below you can see the end of the plug that holds the hook that holds the wiring in place. I needed some pliers to pinch the end enough to push it through the plate, if your hands are more robust you might not need the pliers. 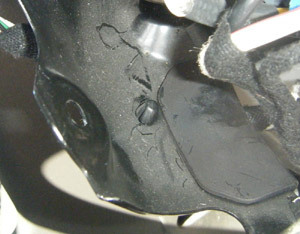 Once the plug is through the hole, the plate should be free to put out of the way. 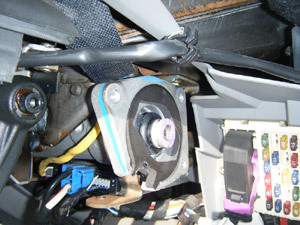 One of the bolts holding the motor on is behind it, and you can't reach it easily as bits of the car's trim are in the way. To give you enough room to get to it, you need to loosen off the two bolts holding the steering column in place on the car. Please only loosen them, don't take them off as then you'll be having a lot more hassle putting everything back together again. Final bit of fiddling before you can finally unbolt the steering motor. 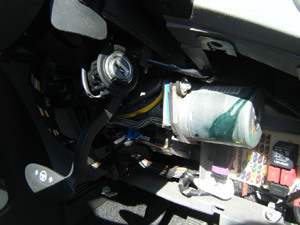 There are two cables coming out of the motor and in to the ECU (Electronic Control Unit) which is the silver box right under the steering column. One cable is covered in silver braid, the other looks like normal plastic covered wires and goes in the slot just above the braided one. Both cables are held in place by clips, so you can't just pull the cables, you have to push the clip in so the connector will come out. 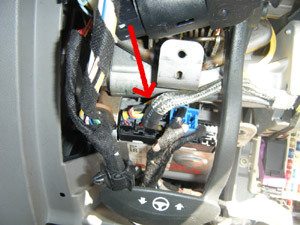 The silver (bottom) cable has the clip at the bottom, the more normal cable has the clip at the top. If you've got very big hands, you might want to use some needle nosed pliers to get at them - the top one is more fiddly than the bottom. The cables might also be held in place by a cable tie, so you'll need to cut through that as you can't get the cables past it. Now to finally unbolt the steering motor! It's held on by three 8mm bolts with slightly odd looking bolt heads. The bolt behind the motor is very awkward to get to and I needed the extender on my little socket set (pictured below.) 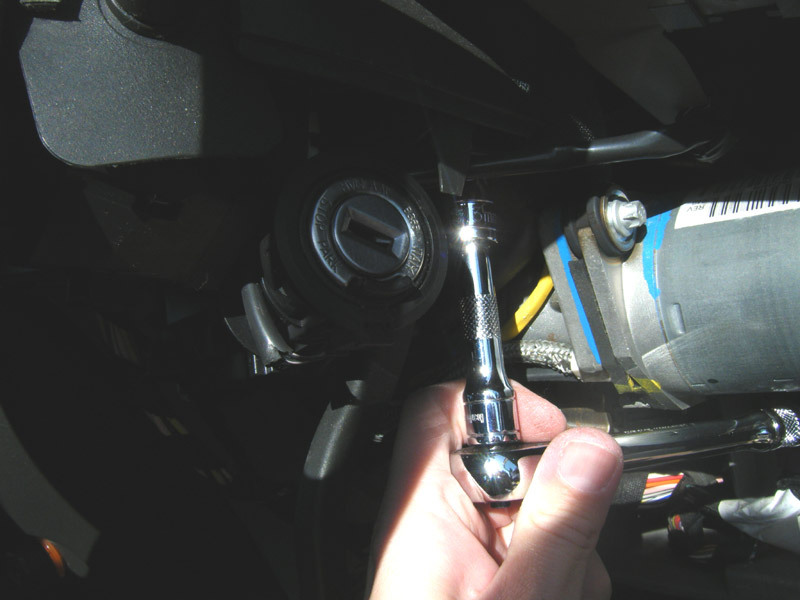 I suggest loosening all the bolts a little, then unscrewing the whole bolt behind the motor first, so the motor is still held in place by the two other bolts, making it slightly easier. I found I had to pull the steering column down a bit by tugging on the steering wheel while unscrewing the difficult to get to bolt. The trim also gets in the way a bit, but that's flexible so it does give a bit if you push it. When all three bolts are off, pull the motor gently sideways to get it off the hole it bolts in to. Apparently there's a small piece that can come off when you do this, but I didn't see anything come out. Here's the motor off and sitting in the foot well. The little black boxes with writing on in the middle of the top are the relays that have gone wrong. The replacement steering motor I got from eBay came with a lot of the rest of the steering attached (see below) so I had to unbolt some stuff to get the motor off. Here's the hole where the old steering motor came off and the replacement one is going to go on. I suggest getting all three bolts on loosely, then tightening up the awkward bolt you can't see first, then the other two. 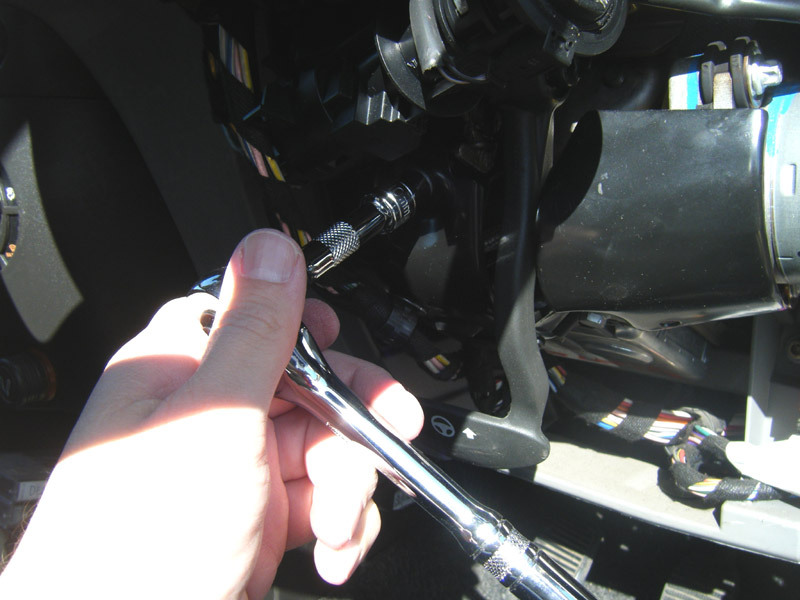 Don't tighten them too much as you don't want to strip the bolts, but make sure they're firm. At this point, I reconnected the battery, started the car and tried the steering and everything worked fine - the power steering was back to normal and worked in both city mode and non-city mode like when we'd first got the car. Before putting everything back together, I disconnected the battery again as you don't want to be messing about with any cables while the battery's connected. Putting it all back together is a matter of going back through the steps of everything you've taken off and putting it back on again. Try not to forget to put the cable hook back on to the plate that covers it, although it's a minor thing that probably isn't a big issue. Especially don't forget to tighten up the bolts that hold the steering column to the car, as driving without them tight will cause the steering column to move up and down as you move the wheel. When you're replacing the plastic cover around the bottom of the steering column, try to line up all the plastic tabs that stick out as they're there to try to keep the covers tight together. They can be a bit of a pain though. 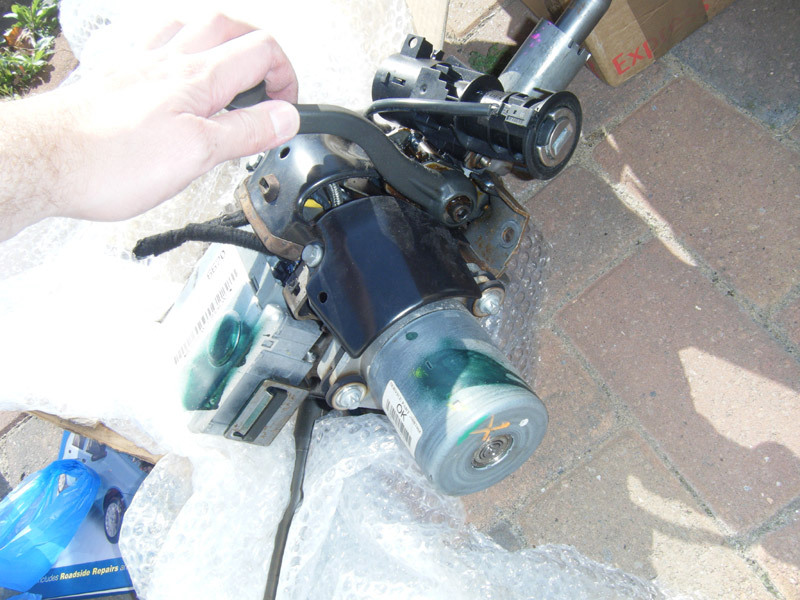 I wish I'd found a cheap(ish) second hand motor and fixed the power steering as soon as started to go wrong as it's a bit of a fiddle but really not that hard, and it's a lot less hassle than driving a car where the power steering cuts out regularly.